So that's what I've been up to this week. 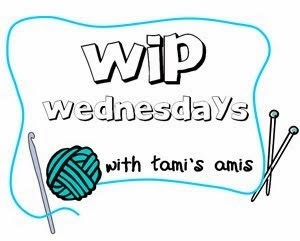 To see what others are working on, go to Tami's Amis' blog. And be sure to check back here for FO Friday - this week will be an epic one! Looking forward to seeing your fo! No stupid questions! lol I wondered the same thing when I was new to the knitting blog world, so trust me you're not alone. FO means Finished Object and WIP means Work In Progress. I guess I should write that on the posts to clarify for new readers. And thanks so much for your kind thoughts! I'm curious to see what that first one is! And man, that shawl is going to be gorgeous, that yarn is beautiful! I'll be back on Friday! :-) The shawl looks beautiful.